I’ve made some decent progress on the staging yard over the past few months. 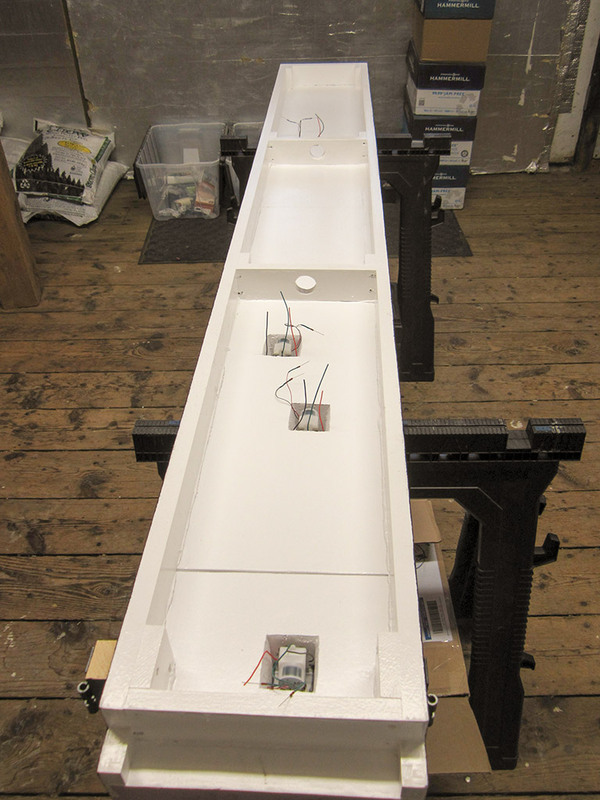 I mounted the Mole turnout motors, laid down the sound deadening material, attached and sanded the roadbed and have begun to lay track. 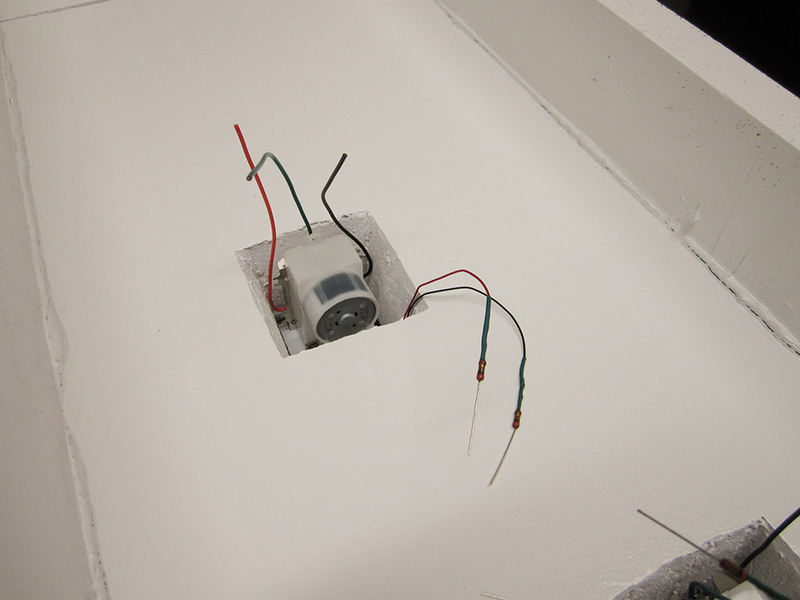 As shown previously, the turnout motors are mounted to two .080” styrene plates with a vertical shaft installed to allow the throw rod to run through the roadbed. This entire assembly is then inserted into a notched cut out in the foam which creates a flush surface over which to glue the cork. On top of this I added a sheet of ~1/8” thick hardwood floor underlayment. This padding is a sort of semi-soft foam that I’m hoping will cut down on noise. On the staging yard I used it to finish the entire top, but on the actual layout it will only be about 1/4” wider than the cork. The product I used is from Home Depot and cost about $50 for a roll that will likely last me a lifetime. The next step was to attach the roadbed. 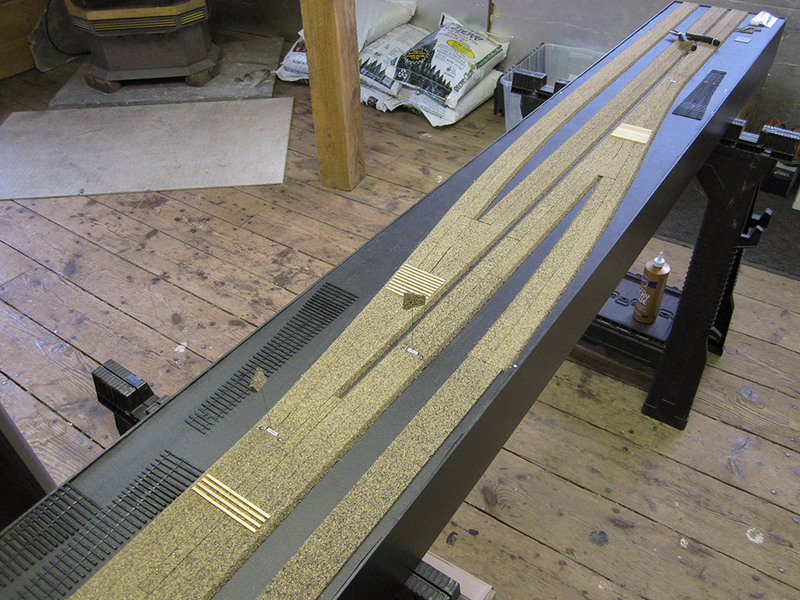 The two tracks that continue the mainline into staging, as well as the stub ended storage siding uses HO roadbed. 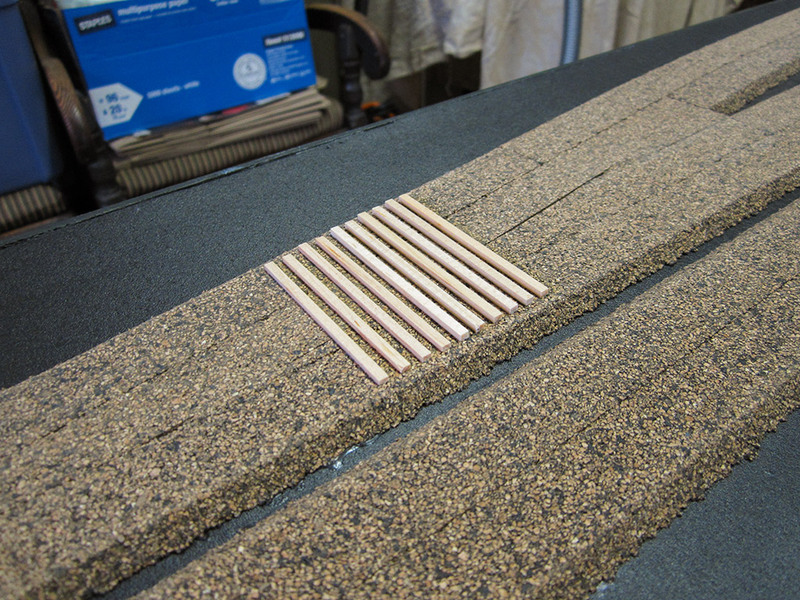 The siding that comes in off the layout uses thinner N scale sized roadbed that I cut to the proper width out of cork sheet. This gradually transitions up to the level of the mainline. Once all the roadbed was down I sanded out any imperfections. Finally, I started to lay down ties. 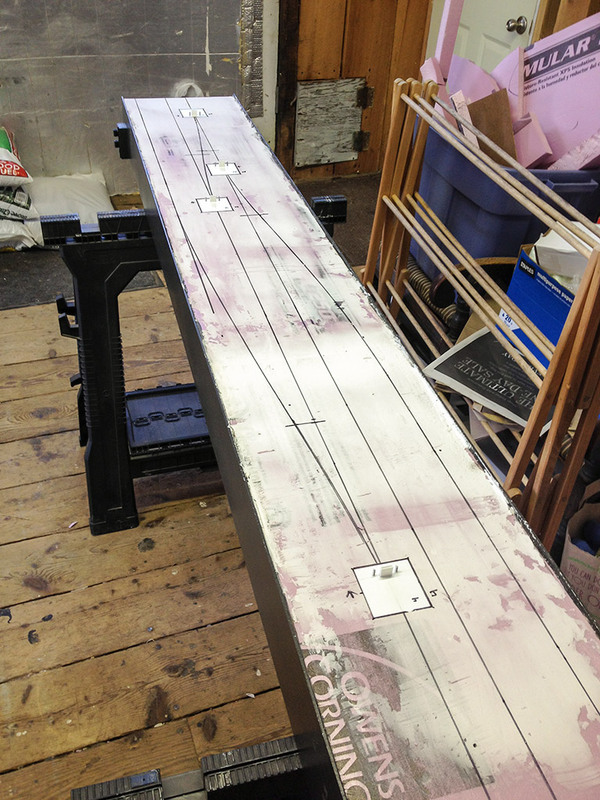 The Central Valley tie strips don’t extend far enough to allow two diverging routes to fit with ties intact, so I purchases some individual extra long wood ties and tie plate details from the Proto:87 stores and glued those to the roadbed to extend the turnout bases farther. Because these individual ties are of prototype thickness, I had to sand them slightly so that they would match the thickness of the Central Valley tie bases which are slightly thinner. This entry was posted in Layout, Model Railroading and tagged Layout, Model Railroading by Milepost15. Bookmark the permalink. 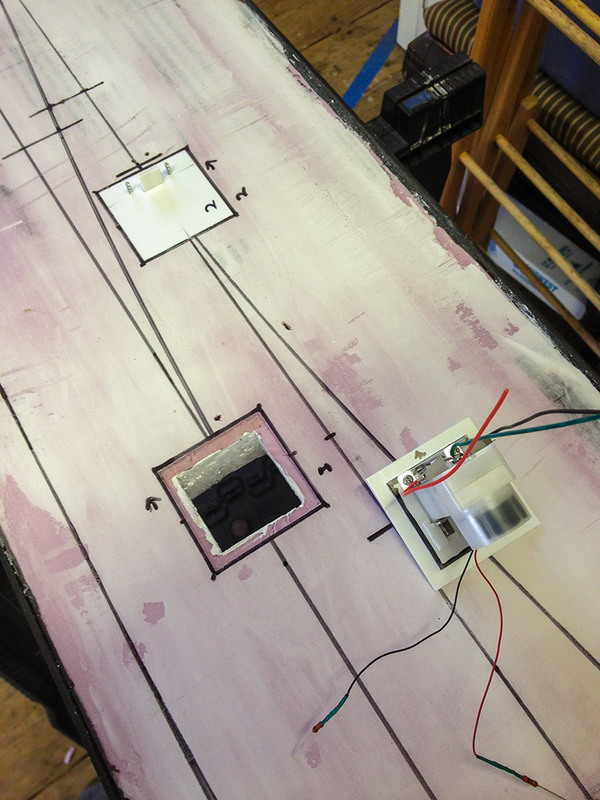 IDF I EVER GET MY MAIN LAYOUT WIRED….THIS WILL BE NEXT! I’m interested in proto87. I like what I have seen as far as your track work goes. Can you post more blog entries relayed to track work. 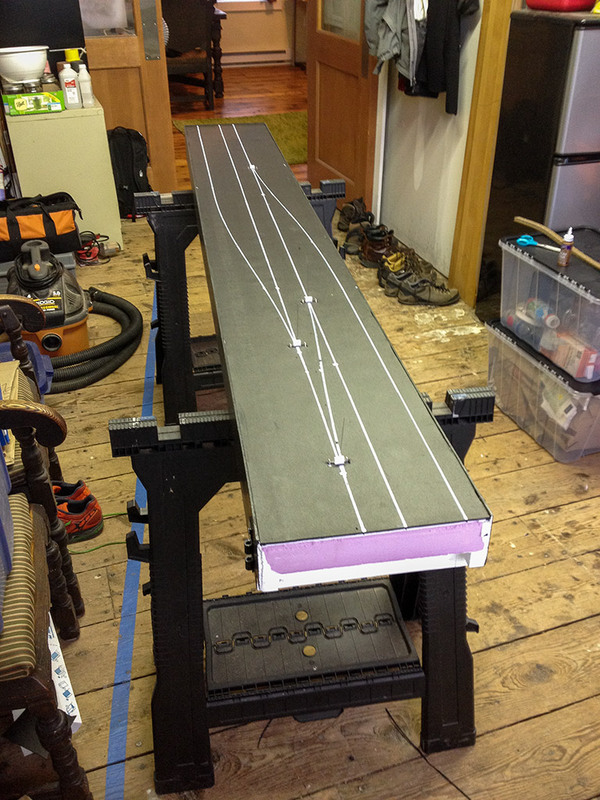 Let’s face it, your model railroad is only as good as your track, and what you have shown so far, looks really good! Keep the posts coming! I have more track related posts planned for the future, but it might be awhile as the layout is currently on hold while I prepare to move (don’t want to lay track and then have to rip it up :-).